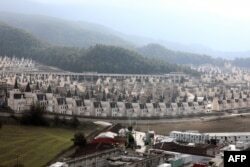 A photo shows hundreds of houses part of the Sarot Group's Burj Al Babas project on Dec. 15, 2018 close to the town center of Mudurnu in the Bolu northwestern region. The ambitious development has been hit by regional turmoil as well as the slump in the Turkish construction industry — a key sector — as the country's economy heads towards what could be a hard landing in an intensifying downturn. After a long period of solid growth, Turkey's economy contracted 1.1 percent in the third quarter, and many economists expect it will enter into recession this year. A photo shows hundreds of houses part of the Sarot Group's Burj Al Babas project, Dec. 15, 2018, close to the town centre of Mudurnu in the Bolu northwestern region. However, Kerim Alain Bertrand, who previously headed up a firm that provided and analyzed data on Turkey's real estate market, said recently he was more optimistic, partly due to the country's growing population.